A golf club is made up of a clubhead, shaft and grip. Golf clubs consist of three key components, each of which may be tailored to an individual golfer's needs. Golf clubs made for professional golfers vs. those made for players with high handicaps will have different clubhead shapes, shaft flex and, potentially, grips. The components of a club work in harmony to give golfers the best possible tool for each situation–whether trying to hit a long, powerful drive or a soft, high chip. The clubhead is located at the bottom of the golf club and may be any number of shapes, depending on the type of club. Driver heads are traditionally the largest clubheads, followed by fairway woods and irons. Clubheads on woods have a bulbous shape that is designed to help the head slide over grass and obtain maximum distance. Clubheads on irons are some form of a blade. The weight of the clubhead may be concentrated in the center of the clubhead or distributed around the perimeter, as is the case with oversized clubheads, which are more forgiving. Putter heads are the most varied group of clubheads and are available in long, rectangular blades, mallets, 2-ball or peripherally weighted shapes. 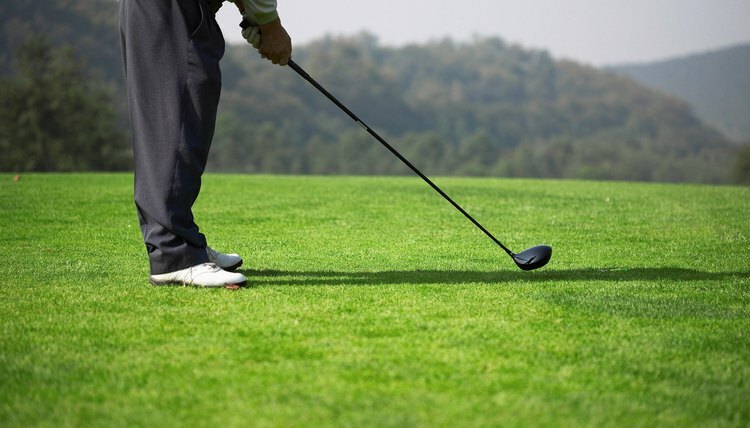 The shaft of a golf club may be cut to the appropriate length for any golfer and is made of steel or carbon fiber. Professional golfers use steel shafts, which are heavier but less forgiving than carbon-fiber shafts. Shafts are generally available in five flexes, so a golfer can choose the flex (the stiffness of the shaft) that best suits his swing. Golfers with slower swings should use a more flexible shaft, while golfers with faster swings benefit from using a stiffer shaft. Shafts are available in the following flexes: stiff (S), which is recommended for low handicappers or pro golfers; extra firm (X), which is recommended for low to mid handicappers; regular (R), which is the most standard shaft and is recommended for mid to high handicappers; senior (A), which is very flexible and is recommended for seniors or fast-swinging women; and ladies (L), which is the most flexible and is recommended for women. The grip of a golf club covers the top quarter of the shaft and is about 10 inches long. Grips may be round, ribbed or corded, and golfers can select the type of grip that feels best to them. Grips are nonslide, allowing the golfer to keep control of the club without gripping it too tightly. Grips are available in different feels and sizes. They may feel stiff or soft, or they may be thin or oversized (extra padding). Some golfers also use grips as a fashion statement, and many companies offer grips in a variety of colors. Grips should be replaced when they become hard or smooth.